As football fever sweeps the globe many would rather not face the uncomfortable truth that darkens the world’s favourite sport. 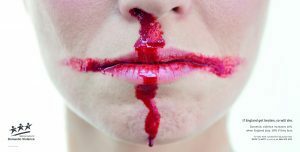 Domestic Violence and the World Cup are closely linked, with reported incidents increasing by 26% if England plays, 38% if England loses and 11% the next day, win or lose. 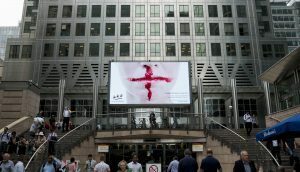 To really bring these stats to life in a dramatic way and remind the country that domestic violence has no place in society, J. Walter Thompson London has created a timely and reactive campaign for the National Centre for Domestic Violence. This furthers their 2016 piece for the National Centre for Domestic Violence, Break the Routine. The suite of powerful images which will be used across digital, OOH and print, will run on all of England, Switzerland and Japan’s match days until the end of the World Cup and reimagines their iconic flags in a way no one can ignore. Comment from CD, Jo Wallace – As fans across the world watch each game with trepidation so too do the partners of some of those fans. This lesser known, darker aspect of football is clearly communicated with this impactful campaign, ‘The Not-So-Beautiful Game’. The team saw these stats and immediately created this excellent work to help reach and support victims of Domestic Violence during the World Cup when they are in particular danger.